The British Parliament passed the Statute of Westminster, granting complete autonomy to its six Dominions. Australia and New Zealand held back from adopting this status, but in 1947 New Zealand became the last of the Dominions to do so. Although this country had moved from being a colony to a Dominion in 1907, few New Zealanders then wanted greater independence from Britain. Racial affinity, language, culture, defence and trade links bound most New Zealanders to the wider ‘Britannic world’, which was then at the height of its prestige. New Zealand’s Prime Minister, Gordon Coates, called this a ‘poisonous document’. 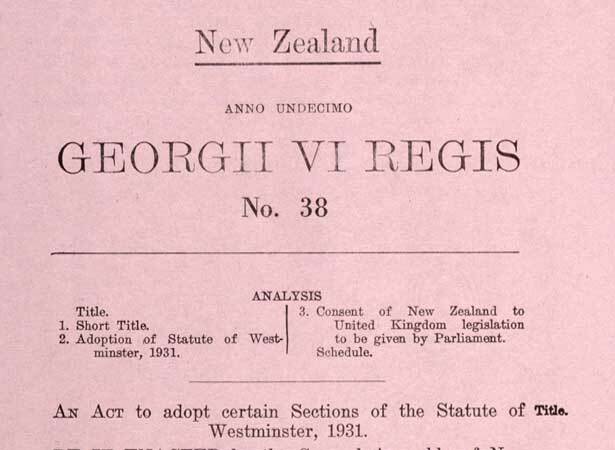 Although the British Parliament subsequently passed the Statute of Westminster, which formally removed London’s right to legislate for the dominions unless they asked it to do so, New Zealand refused to ratify it until 25 November 1947. The Constitution Act 1986 finally removed the last faint provision for the British Parliament to make laws for New Zealand.